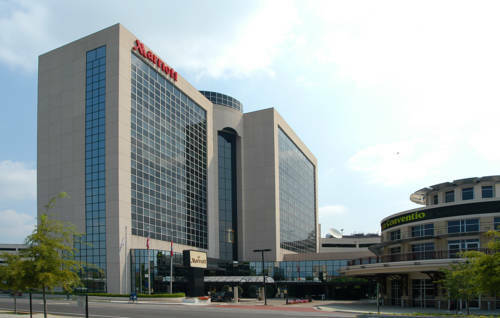 Experience the charm and excitement of downtown Chattanooga from the centrally located Chattanooga Marriott Downtown. Enjoy spacious, tastefully appointed hotel rooms, an abundance of on-site amenities and an unbeatable location. As the only hotel attached to the Chattanooga Convention Center, our accommodations are the ideal choice for business travelers and convention attendees. Unwind in your hotel room, which includes a flat-screen TV, plush bedding, an ergonomic workspace, high-speed Wi-Fi access and more. Keep your workout routine in the hotel's fitness center, then enjoy fantastic Southern cuisine at our restaurant, Table South Kitchen + Bar. Host your next business meeting or celebration in Chattanooga. Our hotel boasts nearly 10,000 square feet of versatile venue space and offers expert planning and catering services. Guests will appreciate our hotel's city center location. We're steps from the Chattanooga Riverfront, the Tennessee Aquarium and other notable destinations. Table South Kitchen + Bar: Taste innovative American cuisine in a vibrant, welcoming atmosphere by visiting Table South Kitchen + Bar. Open for breakfast, lunch and dinner, our new casual restaurant serves Southern-inspired cuisine in vibrant downtown Chattanooga. The Bar at Table South: Join us at The Bar At Table South to sample craft beers or sip a specialty cocktail. Unwind after attending your event at the convention center or meet colleagues over handcrafted drinks. Our downtown Chattanooga bar also offers a full restaurant menu. Lookout Caf : Energize your day with a fresh-brewed Starbucks coffee or tea, a delectable pastry and more by visiting Lookout Caf , the ideal spot for guests on-the-go. Before your event at the Chattanooga Convention Center, stop by our casual and convenient caf .